For most Americans, travel to Cuba, at least directly from the States, has been out of the question for decades. 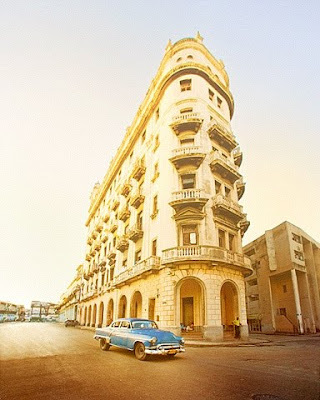 Visiting this "forbidden" land isn't impossible, though, and after viewing American photographer Melani Lust's impressions of Havana, I hear the country calling me to find a way to get there. These images spark in me a curiosity that won't be satisfied until I make my way to the island. What is now a dream of munching on fried plantains, chatting with locals, and dancing to son cubano, will someday be my reality. If you're like me, during the interim you find other ways to satisfy your cravings, such as my continuing efforts to make a decent mojito in my Swiss kitchen. As for you, mark your calendars for March 2010 when a little bit of La Havana will grace Amelia Island (near Jacksonville, Florida) with her presence. CarHavana, a joint exhibition between fellow artists Melani Lust and Brayan Alonso Collazo, of Cuba, features photographs of American cars from the 1950s - classics frozen in time, like much of the country. 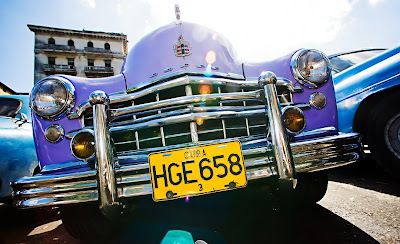 After a fruitful run from May 8 - June 9, 2009 at the Deposito de Automovíles in Old Havana, the exhibition will reemerge at Amelia Island Concours d'Elegance, an international car show, March 12-14, 2010. This is no ordinary exhibition and its presence in Florida is significant and deliberate. According to Melani, "The exhibitors explained that CarHavana will make the Concours d'Elegance cutting edge and signals a new direction of diplomacy and the eroding barriers between Cuba and the U.S. because the show is a joint exhibit from citizens of the two countries." What may seem to be an exhibit that merely documents the pristine condition of Havana's "Oldtimers," as old-fashioned cars are called in German, is actually so much more. The artists have created an opportunity to dialogue about the reality of the U.S.-Cuba embargo and its impact on the Cuban people. As CarHavana continues to tour the country, possibly to New York and Puerto Rico next, so too may the dialogue continue. As for Melani's vision for CarHavana, she offers, "I hope that the show will mark a beginning of a joint effort among artists to do whatever they can to work together and exchange ideas, that this type of cooperation evolves to the branches of government is my greatest hope." All images are by Melani Lust Photography and featured on this blog with special permission from the artist.